Almost every region of the world has a cryptid that haunts the backwoods of civilization. North America has the hairy and elusive Sasquatch (often referred to as bigfoot), the United Kingdom has the Loch Ness monster (Nessie) and Latin America has the chupacabra. For those unfamiliar with the term, cryptids are animals, plants or beings whose presumptive existence is regularly derided for using anecdotal evidence deemed insufficient by the mainstream scientific community. This evidence often comes in the form of questionable footprints, tufts of hair and/or grainy black and white photographs. Despite substantial criticism from the scientific community, cryptids have captured the public’s imagination and moved from the shadows of the obscure into popular culture. Sometimes referred to as the yeren, Chinese wildman or man-monkey, the yiren is a cryptid hominid-like creature alleged to be living in the mountainous and heavily forested regions of Hubei province. Similar to the North American bigfoot, the creature is generally described as being notably larger than a human and sporting a thick coat of grey or red (or both) fur. The first ‘scientific’ sighting, according to numerous cryptid forums, was made in 1940 by Wang Zelin, a biologist educated in Chicago. Zelin was part of a group that stumbled across a recently shot female yiren, while traveling between Jiangluo City and Niangniang Plain, and he described the creature as looking very similar to the plaster model of a female Chinese Homo erectus (Peking man). This cryptid is one of the more mysterious creatures on our list. Sky serpents (sometimes referred to as sky snakes) are long snake-like creatures that appear to drift or slither through the air. Although different than dragons (most notably for their lack of wings), some sky serpents have been rumored to unleash fire and, in some cases, lightning. While sky serpents have been sighted in China, they have also been spotted in other regions of the world (because, you know, they can fly), including North America. First sighted in 1903, this alleged lake beast (or possibly beasts) is China’s answer to Scotland’s Loch Ness monster. The Guai Wu are said to live Tianchi Lake, in China’s northern province of Jilin. Descriptions of the creature vary greatly, but most witnesses describe seeing a large aquatic animal with a head that resembles a seal. In 2007, a Chinese TV reporter claimed to have witnessed six creatures playing on the lake surface; he described them as having fins or wings that were “longer than their bodies.” It is unclear if this video ever surfaced. No good cryptid roundup is complete without a mysterious plant and the Jinmenju is exactly that. 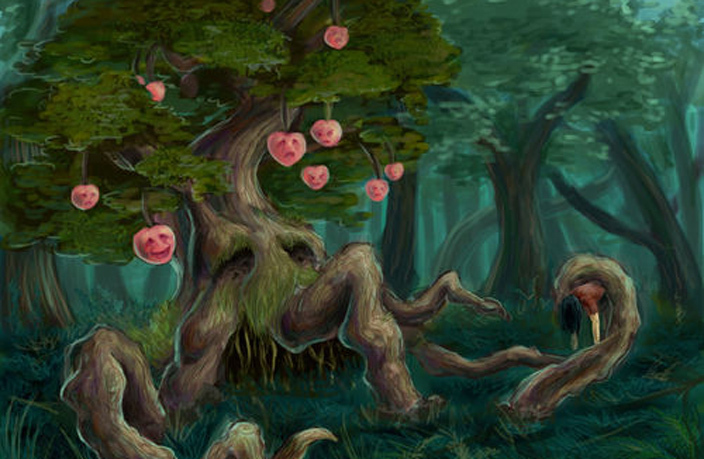 Alleged to grow in southern China, this human-tree hybrid is said to grow smiling human heads for fruit. The seeds of the fruit are also supposed to resemble smiling faces. By some accounts, when the face fruit ripens, it is edible and has a sweet and sour taste. In earlier times, it is said the trees were plentiful and, in some instances, farmed. The landscape was said to be abuzz with the laughter of a thousand happy heads. Our last cryptid is another humanoid-type creature. The xing-xing is said to resemble an orangutan and, much like the yiren, it is often compared to the North American bigfoot. Online cryptid forums have a wide array of suggested sizes for the xing-xing, with some claiming it is a small species of primate and others suggesting it can grow to a height of 10 feet. The xing-xing supposedly lives in the Himalayan Mountains, meaning it shares territory with another famous cryptid – the yeti. It should be noted the xing-xing of the Himalayas shares its name with a Japanese mythological sea creature known for its love of alcohol. When it comes to urban myths in Shanghai, this is one every local has heard of. Up there, where the air is rarefied…Failing brakes and breathtaking beauty. Authorities promote eco-burials as the environment increasingly becomes a grave concern.